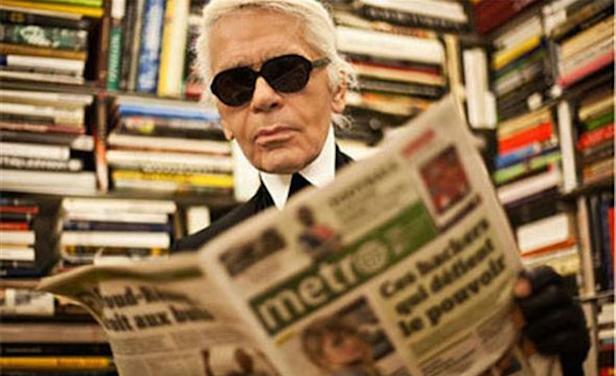 What Can We Expect From Karl Lagerfeld's Column For The Wall Street Journal? Karl Lagerfeld is the busiest man in business - between designing his own line, as well as being top boss at Fendi and Chanel, he's also found time to design a range of footwear for shoe label Melissa, and now, will be writing his very own column in The Wall Street Journal magazine, under the new editorship of Kristina O'Neill. For her first issue of WSJ, O'Neill has asked King Karl to write a column on discipline - the debut issue's theme. This isn't the first time KL has tried his hand at editorial work - he guest-edited free newspaper Metro last year with huge sucess! So what can we expect from Le Lagerfeld? Well one things for sure, as the most outspoken gent in the business, we're sure he won't hold back when it comes to his opinion - and with a no-nonsense approach to just about everything - except of course his sweet Choupette - we can expect some fabulous Karl Koutes to add to the archive. To get the juices flowing - we suggest he has a peek at our favourite twenty five Karl Lagerfeld nuggets of wisdom below. Enjoy!